Perform multiple experiments using several common powders such as corn starch, baking powder, baking soda, salt, and gelatin. The results of the research on the known powders can then be used to analyze several unknowns using the scientific method. The unknowns can be a single powder or a combination of the known powders. Crime scene investigators often gather evidence from a crime scene and many times the evidence has to be ... (more)analyzed in a forensic laboratory. This evidence can include unknown powders found at a crime scene. This is a modification to the Student worksheets that provides more structure to the unknown vocabulary a... (more)nd limits the number of challenge trials a student is to complete. The student engagement is awesome. This allows students to examine evidence of chemical changes. Great to use before actually doing this in class! Wonderful way to do testing when it can't be done in your class or home. My students loved this gizmo so much they didn't want to stop. It really helped reinforce chemical properties. this assignment uses the process of elimination and many aspects of the Scientific Method. It is a great starting assignment for Chemistry. 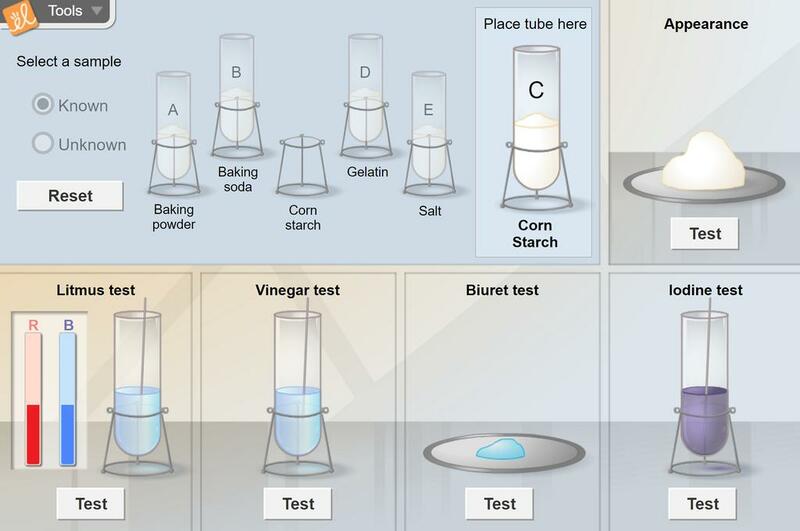 This virtual laboratory experiment is great if you're short on space or time. It may also be used as an intro to building lab skills. Great to use during a Forensic Science unit. Excellent when you don't have the necessary materials! Have the do this gizmo a day or two before doing a similar lab experiment. It gives them a real feel for what they need to do in a lab. Great Gizmo, I use this every year to teach physical and chemical properties. Scientific Method with mystery powders! This is an excellent beginning of teh school year 8th grade gizmo!